“It is finished,” a woman declares to her friends when speaking of her decision to exit from her marriage. After years of abuse, unending quarrels, and infidelity, she announces that she had had enough. These words pretty much sums up her feeling of resignation, “It is finished.” But the pronouncement isn’t always bleak. At the end of a hard day’s work or the completion of a project, the words could also have a triumphant ring to it – “It is finished.” “It is completed.” “It’s perfect.” As a much awaited confirmation that the conflict is over, it carries with it a string of hopeful promises, dreams once thought unattainable but now definitively realised with the cessation of war- “It is finished” – no more killing, no more casualties, no more destruction, only peace from now on. When slaves first got wind of the Declaration of Emancipation, it must have conjured images of the end of centuries of oppression. It is finished! Free at last! Free at last! Thank God I’m free at last! 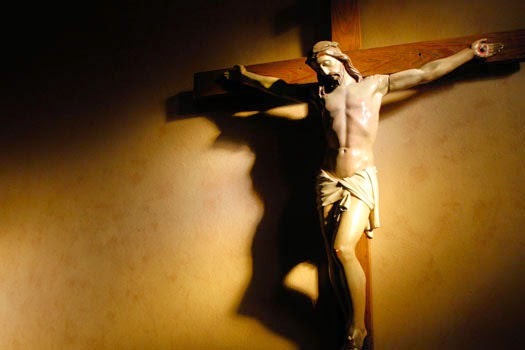 “Consummatum est!” “It is finished.” These are the words uttered by Jesus in his last breath on the cross. At the time, the moment was filled with too much emotion for those words to sink in and to ponder what they meant. But later as the early Christians read John’s Gospel and heard again those words, it dawned on them just how powerful these dying words of Jesus were. “It is finished.” What is it? And how is it finished? The phrase is actually one word in Greek – tetelestai. The term literally means “the goal has been reached!” In sports, it would have been used to describe finishing the race as the winner; upon crossing the finishing line, the crowds would have shouted, tetelestai. It was a term used in agriculture, to describe, for example when there was born into his herd an animal so shapely that it seemed destitute of defects, the farmer, gazing on the creature with delighted eyes exclaimed tetelestai. It was a term familiar to artists too. When the painter had put the finishing touches to the vivid landscape, he would stand back and admire his masterpiece. Seeing that nothing called for correction or improvement he would murmur, tetelestai. But it was also a term that would have been familiar in religious circles. When some devout worshipper overflowing with gratitude for mercies received brought to the temple a lamb without blemish, the pride of the flock, the priest, more accustomed to seeing blind and defective animals led to the altar, would look admiringly at the pretty creature and say tetelestai. When, in the fullness of time Christ ran and finished the race, completed and perfected the task the Father had given to him, in his hour of glory, the Lamb of God offered himself on the altar of the cross, a perfect, flawless sacrifice, he cried with a loud voice, tetelestai. It is finished, it is completed, it is done, it is perfected. And this is what he finished - He finished the great act of salvation in which we have been saved from God’s wrath, he paid the ransom price to free us, he took upon himself the punishment and pain of separation that was due to us, he disarmed the powers and authorities that were ranged against us and in that one act of humiliation and sacrifice he glorified himself. That is why Good Friday means so much to us. Though, most of us will never be able to complete the work of the Kingdom, we should not despair. This is because Jesus Christ had come to finish the job and to complete the work that we always seem to be unfinished. Jesus would not be satisfied with just starting the work. It is crucial that he completed it. If he had stopped short at being a carpenter, being a preacher, being a healer and miracle worker, but did not carry through with his plan to march up Calvary, his work would have been incomplete. Salvation would not have been secured, the promise of eternal life would still be uncertain, the power of the devil would be undiminished and death still an undefeated last enemy. But he finished the work, he completed the task, he did what he came to do. Humans are born to live, but Jesus was born to die and he finished the task assigned to him. But our Christian story does not end on this heroic but morbid note. The story of how Jesus completes the work entrusted to Him has another ending, and it is found beyond the cross, beyond the tomb. But that would be the tale of the resurrection; a story to be told another day!